Oh my boys, when did you get so big? !I definitely felt all of the emotions this morning as we dropped these two off at school for the start of what is a new chapter for us this morning. Ethan went into year one today and he was so excited to see his friends again. He was more excited than nervous which was so reassuring to see. I love how confident he is with school, especially as I was totally the opposite as a child myself. It wasn't particularly that I wasn't confident, more that I was so clingy to my Mum and hated her leaving me. 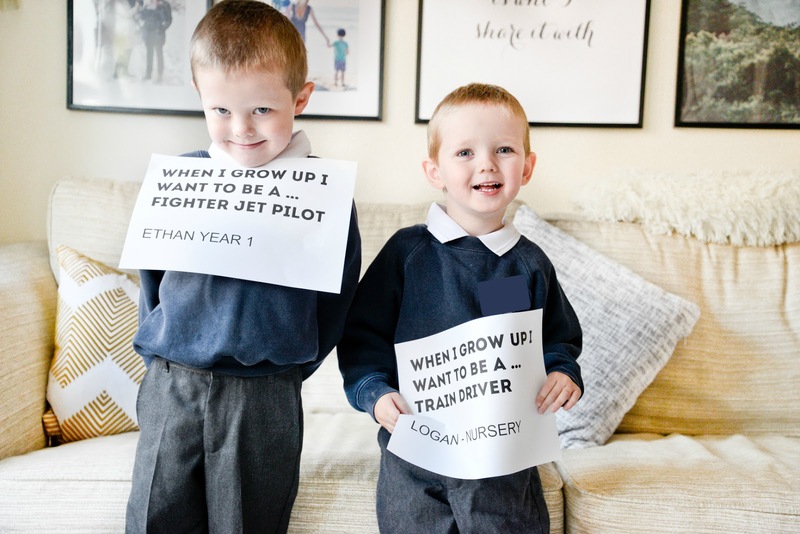 But it makes me so proud to see that going into school for the day doesn't faze Ethan, he's more excited than anything. 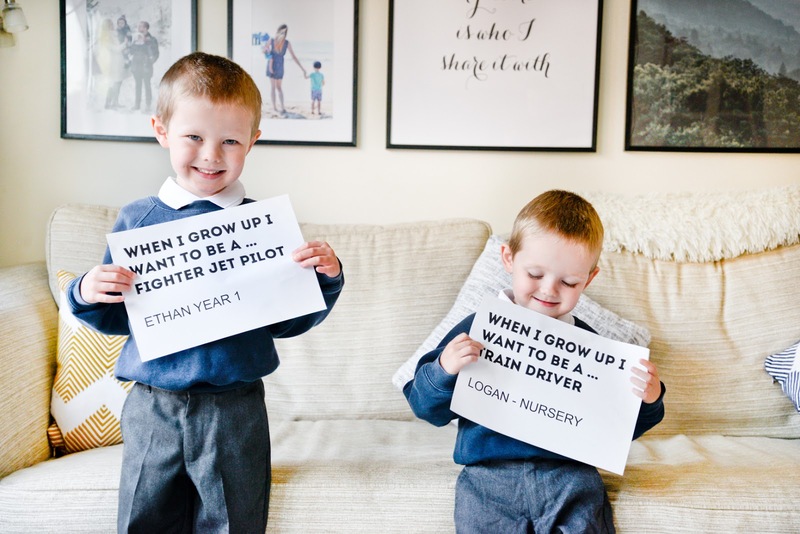 And then little Logan, well he made my heart burst over and over just seeing him in his little uniform heading into his first day of school with his big brother. He held our hand the whole way there and I was worried that he’d get clingy and possibly upset when we went to leave, but he was totally in his element. He found the trains and was so busy showing the other children them that he wasn’t really bothered that we were leaving. I felt a bit wobbly leaving him just because it’s all so new for him (and for me), but mostly I’m so so excited for him. He couldn’t love numbers and letters more and he loves playing with other children and having lots of activities to do. The two teachers they have there are so friendly and nice and I’ve seen how well Ethan does at the school and how much he enjoys it. So I know that Logan is going to love it too. Today feels like the start of a brand new chapter for us today but physically and emotionally. But I'm feeling positive about it, even though it's sort of scary how fast the years go when you look back. I put Logan to bed last night with a few tears in my eyes remembering how I felt when I'd just had him and now here we are with both of my children in school. But Logan's so ready for it and he's been ready for a while now. And as for Adam and I, we're ready too, it's going to be nice to have dedicated work time and to be able to deal with life admin and other adult responsibilities whilst the boys are off at school and then to have that quality time with them when they get home. Juggling so much whilst they've been young has often felt quite straining and it's certainly thrown up a lot of guilt when we've felt like we haven't been able to split ourselves between everything equally, so this new routine and chapter of our lives should hopefully really help us all to start feeling more organised and balanced. Handsome boys! Amazing how fast are they growing! So happy for you! Oh they look so smart and gorgeous! William starts reception tomorrow so I'm feeling all the emotions! Ah, it's such a magical and emotional time! Your pictures have captured it beautifully. Every time mine start a new year at school it reminds me of how much they're growing up and it makes me emotional. Ahh I felt the same, now Harry is in school it feels as though everything has changed and Im still not sure where I fit with it all, it's such. huge change!